Some 2,472 delegates have attended the 2016 Republican National Convention in Cleveland, Ohio, July 18–21 to select the presidential nominee. The winner must carry 1,237—half of the total, plus one. If no single candidate has secured a majority of delegates after the first ballot, a brokered convention results. It has not happened since the 1976 Republican National Convention. Both houses of the Texas Legislature are controlled by the Republican Party (98–52 in the Texas House of Representatives and 20–11 in the Texas Senate) and both chambers are presided over by a Republican ( Joe Straus as the Speaker of the House, and Dan Patrick as Lieutenant Governor, which presides over the Senate); thus, Texas two additional delegates under this provision (one for having at least one chamber meeting the criteria, and one for having both chambers meet the criteria). Both United States Senators from Texas are Republicans ( John Cornyn and Ted Cruz); thus, Texas earns two additional delegates under this provision (one for each Republican Senator). Both United States Senators from California are Democrats ( Barbara Boxer and Dianne Feinstein), and California has not elected a Republican Senator within the past six years (both Boxer and Feinstein were elected in 1992; Feinstein in a regular election and Boxer in a special election). One additional delegate as the current Governor of Wyoming ( Matt Mead) is Republican. As the single member of the Wyoming delegation within the House of Representatives is Republican ( Cynthia Lummis); thus, one additional delegate under this provision. As both houses of the Wyoming Legislature are controlled by the GOP (52-8 in the Wyoming House of Representatives and 26–4 in the Wyoming Senate) and both chambers are presided over by a Republican ( Kermit Brown as the Speaker of the House, and Phil Nicholas as President of the Senate), two additional delegates (one for having any chamber meeting the criteria, and one additional for having both chambers meet the criteria). As both United States Senators from Wyoming are Republicans ( John Barrasso and Mike Enzi), two additional delegates. The 1860 convention nominated the first successful GOP presidential candidate, Abraham Lincoln of Illinois and nominated Hanibal Hamlin of Maine for Vice President. The 1864 event, with the American Civil War raging, was branded as the " National Union Convention" as it included Democrats who remained loyal to the Union and nominated Andrew Johnson, who had been elected Governor of Tennessee as a Democrat, for Vice President. The Republicans returned to Cleveland in 1936 in the cavernous Cleveland Public Auditorium. Former President Herbert Hoover addressed the delegates on the second day of the convention. On the third, Alf Landon of Kansas (who did not attend) was nominated for President; Col Frank Knox was nominated as Vice Presidential candidate. Landon and Knox were defeated in a landslide by FDR and John Nance Garner. Knox subsequently served as Secretary of the Navy in the Roosevelt administration. The 1940 convention was the first national convention of any party broadcast on live television. It was carried by an early version of the NBC Television Network, and consisted of flagship W2XBS (now WNBC) in New York City, W3XE (now KYW-TV) in Philadelphia and W2XB (now WRGB) in Schenectady/ Albany. 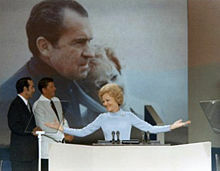 At the 1972 convention, First Lady Pat Nixon became the first First Lady since Eleanor Roosevelt and the first Republican First Lady to deliver an address to the convention delegates. It is now common practice for the presidential candidate's spouse to deliver an address to the delegates. Also in 1972, the placing of " Favorite Son" candidate's names into nomination was banned, requiring at least five states' request to do so. In recent years, only one candidate's name has been put into nomination, and challengers have been put under intense pressure to withdraw in order for the vote to be unanimous.